I’ll be honest, I waffled on making a post like this, because I don’t view MAX FAQs as my personal blog. It was never my intent to use this site to write about personal things in my life that have nothing to do with rail, because non-rail topics and personal stories aren’t the scope of what I want to cover in here – I think that sort of thing is irrelevant. I want to keep this blog as more of a factual “This is how this or that thing at rail works” and not post personal things unrelated to rail operation. Now you could argue that I’m just too lowbrow to appreciate art, and you might be right. 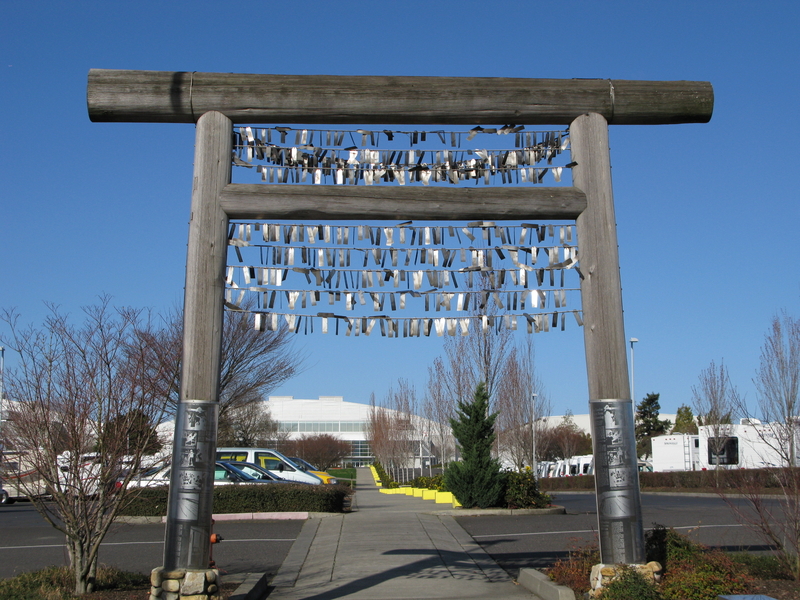 In my defense, I’m not anti-art on rail platforms – I like the feathers at Gateway, the entirety of Washington Park, the Expo gates, etc (though I’m still not sold on the Rockwood Sunrise). I also like the Swedish subway art. But I personally don’t find this sculpture aesthetically pleasing. 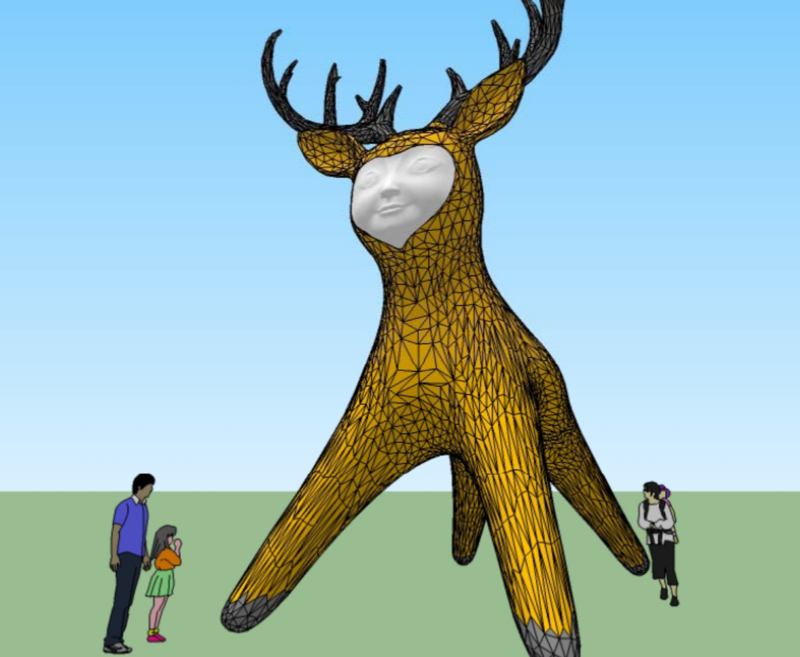 Maybe part of my negative reaction comes from spending $250,000 on a giant deer with a human face at the same time that fares are going up and buses are falling apart, and poor Dorothy is out of luck after the bond measure failed. I understand that there was a mandatory art budget for the Orange Line so money is going to be spent on art anyway, but so far the reaction to this particular piece seems overwhelmingly negative – the other proposed pieces aren’t having nearly the same kind of reaction. I guess I just hope that the art budget is ultimately spent on things that people want to see at their platforms. Today’s question is about pantographs. Why don’t pantographs wear out or break? Pretty much everything on the train is breakable (this is not an invitation), though instances of something serious like a pantograph breaking are rare. 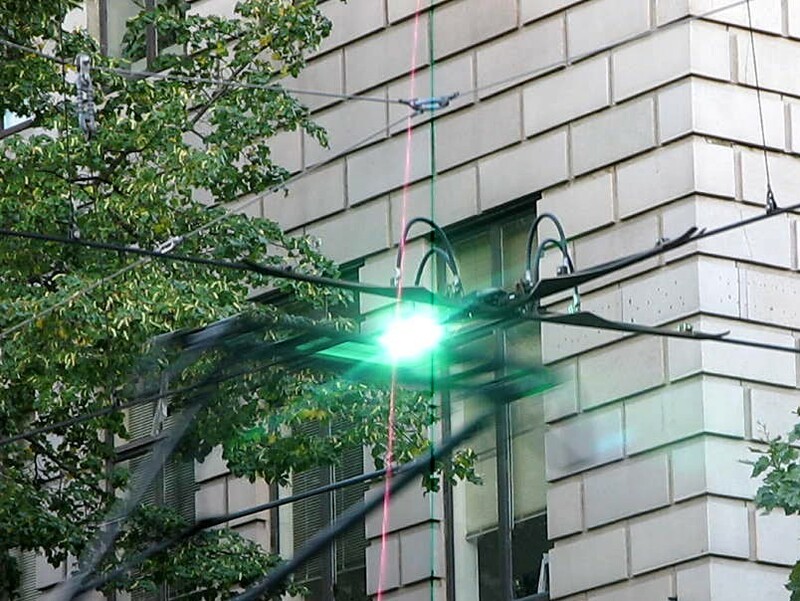 Mechanics, operators, supervisors, and even the public tend to notice excessive arcing that often indicates something is wrong before a pantograph reaches a breaking point. 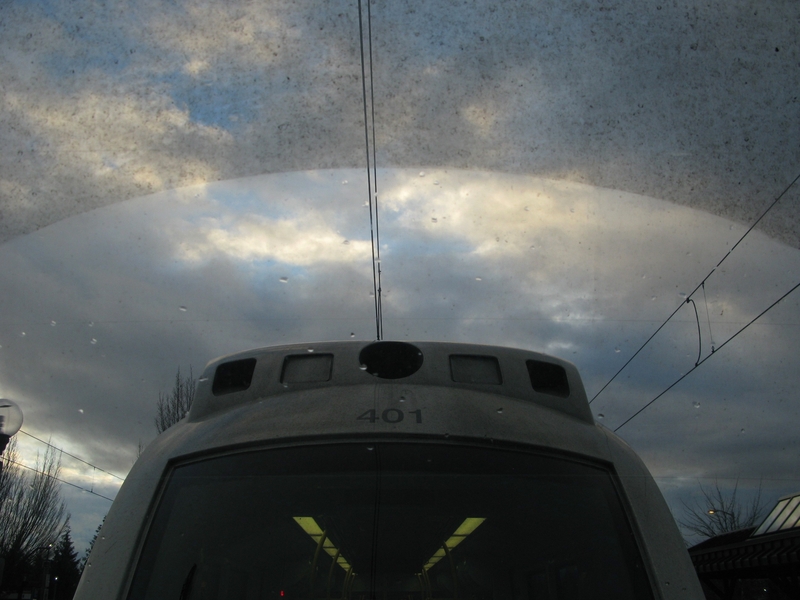 Arcing when the lines are icy or where wires cross – such as around Pioneer Courthouse – is not unusual, but repeated arcing when it looks like the overhead is perfectly clear is not normal and could be indicative of something wrong with the pantograph. 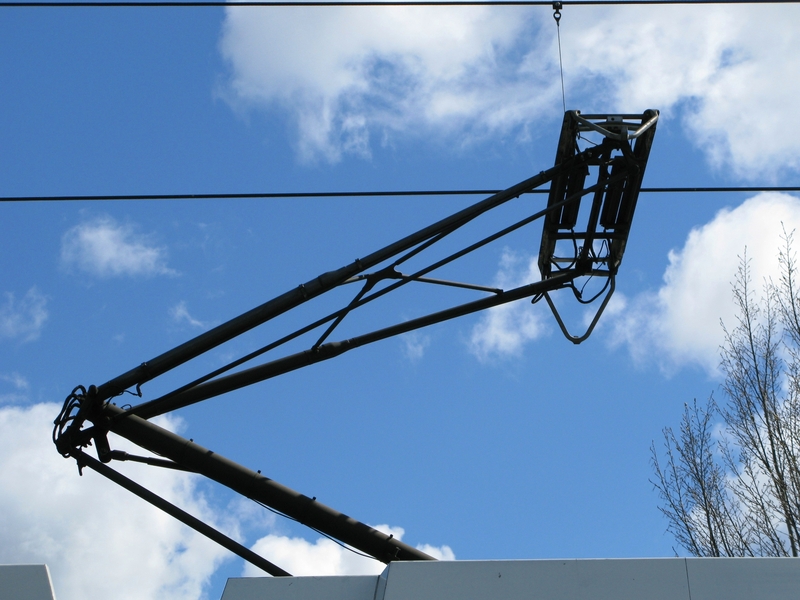 As mentioned in the earlier pantograph post, the part of the pantograph that makes contact with the overhead wire is called the carbon shoe. The carbon on this is a lot like pencil lead – if you ran your finger over a carbon shoe, it’d leave a dusty black streak on your hand. This is the source of the gritty black dust on the trains which is most noticeable around the coupled cabs. Also previously mentioned, the overhead wires are staggered so that they make a zigzag motion over the pantograph. This ensures that the carbon shoe wears down evenly across the length of its surface. Under normal wear and tear, a carbon shoe can last from 9 months to a year before it needs to be replaced. It can happen sometimes that rather than sweeping back and forth over the carbon shoe, the catenary will instead wear a narrow groove into the carbon, causing the wire to become stuck in the groove and wear just that part of the carbon shoe down. Potentially the wire can saw down into the pantograph if the groove is not noticed and fixed – remember that the spring-loaded pantograph puts a considerable amount of upward pressure on the overhead wire. 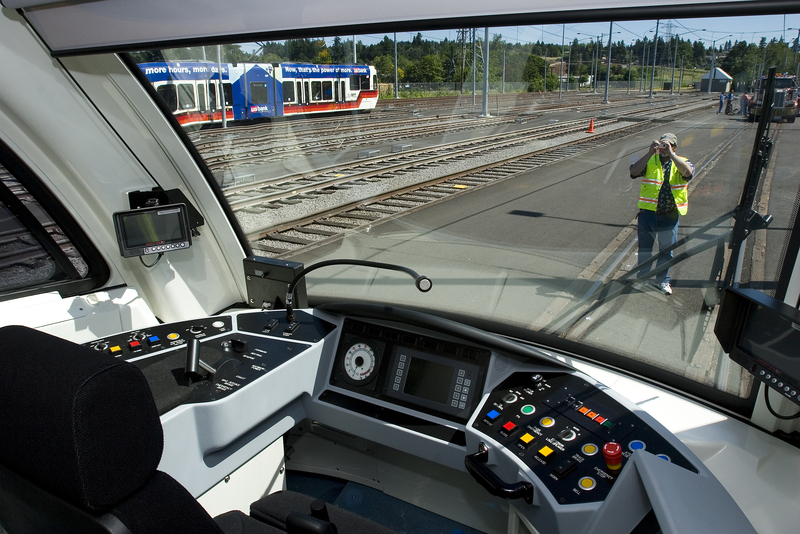 A groove in the carbon shoe will require the train be pulled out of service so that the carbon shoe can be replaced before the pantograph breaks. This is one potential cause of a pantograph breaking. Another cause can be extreme heat, and we’re getting near that time again.. well, maybe, if we get any proper heat waves now that it’s summer. As I posted last year, hot weather causes the overhead wire to sag when the weights on the catenary poles hit bottom and can’t provide enough tension in the overhead wire. When this happens, train speed is reduced to prevent the pantograph from getting caught in or pulling down the overhead wire, which would do significant damage to both. 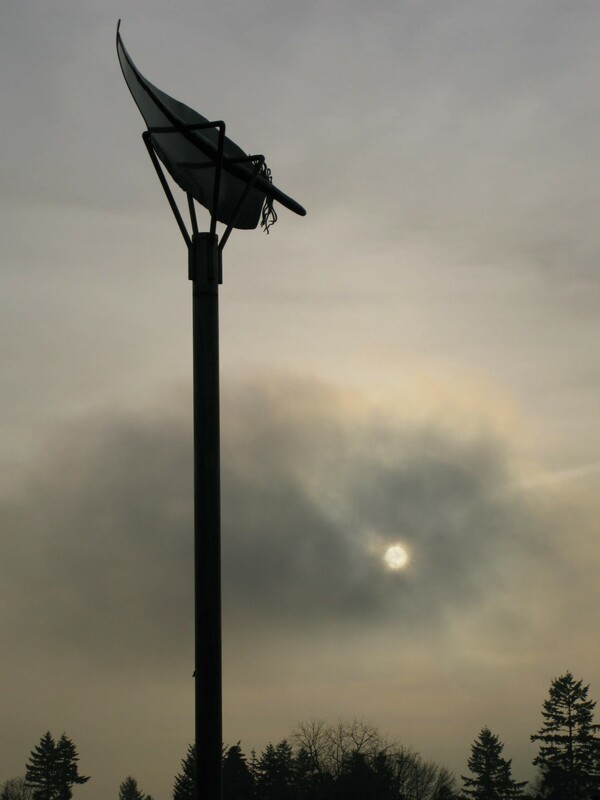 It’s also possible that damage to the overhead wire can break a pan, such as intentional vandalism. This is part of the reason for sweep trains every morning as well as regular walking inspections of the overhead wires to check for any damage or anything else that looks questionable. How can you tell something broke? In Type 1-3 cars, often the first visible indication that an operator sees that something went wrong with one of the pantographs is the “AUX FAIL” annunciator in the console lighting up (the reason why it’s lit in the above picture was actually for an HVAC fault in the Type 1, not anything with the pantographs, but I don’t personally have any pantograph problem photos. There are several different kinds of mechanical problems with the trains that will cause an aux fail). Type 4 consoles are different; the AUX FAIL annunciator reads AUX FAULT instead, there is also a MAJOR FAULT annunciator (though you can’t really see the annunciators in that linked picture), and there is also the TOD, or Train Operator Display screen next to the speedometer which displays mechanical problems with the train. And it goes without saying, but the train will also not operate properly if the pantograph is breaking or broken (moving sluggishly or not at all, lights going out, etc). 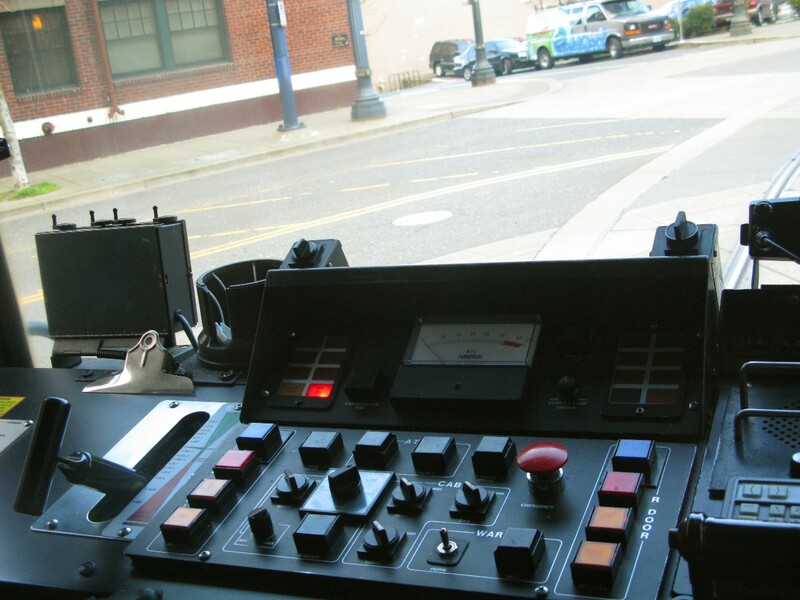 Operators notify Control if there is any indication of a mechanical problem – an aux fail could be something benign like the HVAC blowers not working, but it could also be the first clue you have that your pantograph is currently being shredded. So yes, pantographs can break, but it’s rare to have your trip disrupted because of a broken pantograph. The parts of them that are designed to wear out (such as the carbon shoe) are monitored and replaced when needed. 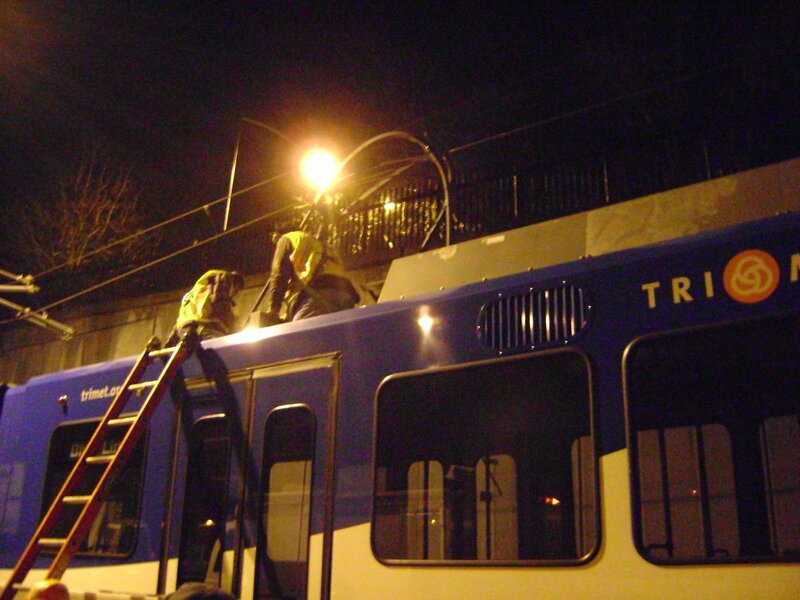 Of course, no post about broken pantographs would be complete without this (non-TriMet) video. Not really sure what the backstory of it is – some of the comments say it was done as a test but I don’t know if that’s true. The last couple of days saw the arrival of the Naval Fleet for Fleet Week. 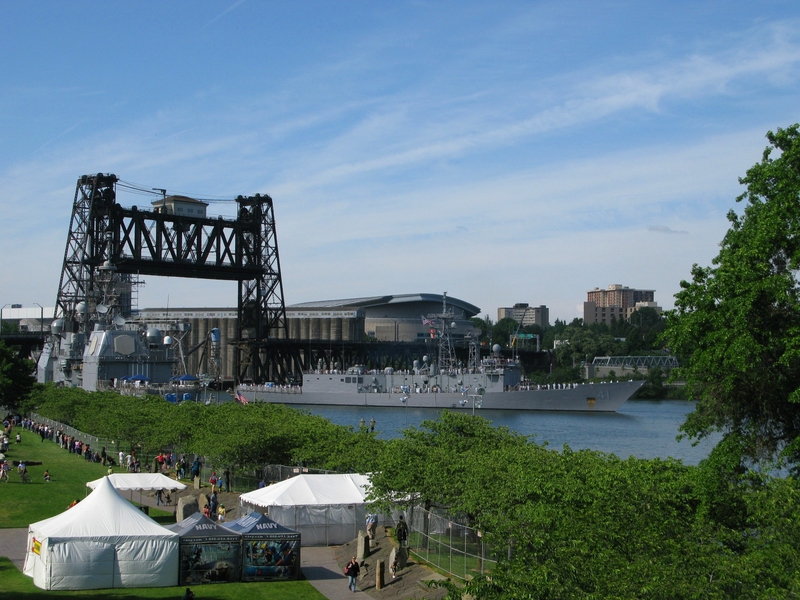 It happens every year as part of the Rose Festival in Portland, and it requires bridge lifts to allow the ships to proceed down the Willamette River. And yes, this means delays in travel times on the trains – being on the wrong side of the Steel Bridge when a lift of the upper deck is required puts trains way behind schedule and makes for some packed trains for passengers. When only the lower deck of the Steel Bridge needs to be raised (detailed diagram of the decks and lifting mechanism… Wikipedia, what can’t you do? 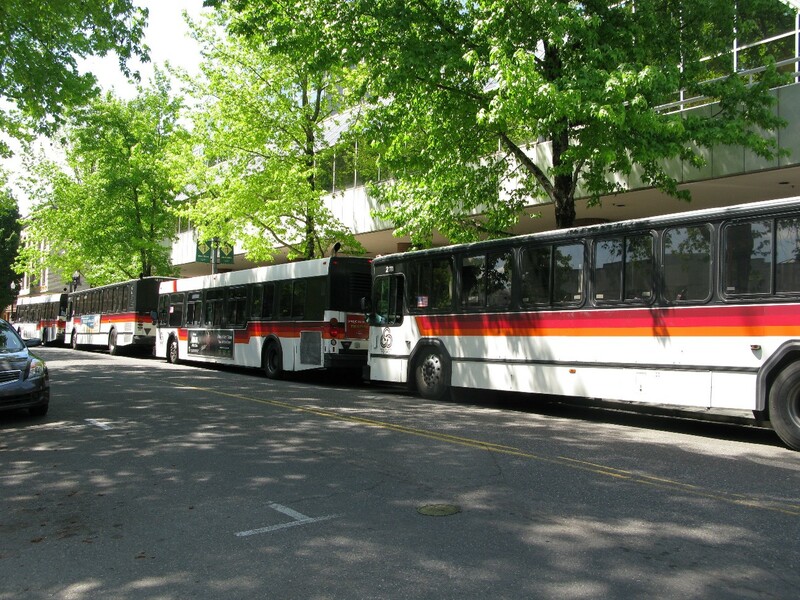 ), MAX service can continue as normal on the upper deck. It’s when the upper deck also needs to be raised that trains will either be held at platforms to wait for the bridge to go back down, or alternatively turned back the way they came. 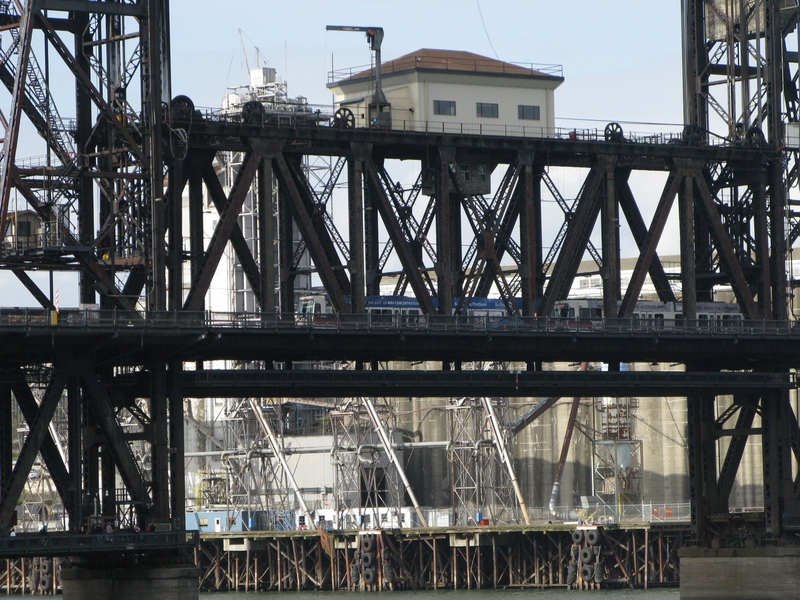 Maritime traffic takes priority over rail traffic, which is why MAX service can and will be interrupted for long periods of time whenever the Steel Bridge needs to be lifted (not just for Fleet Week, but whenever a ship or boat that needs the upper deck to be raised is passing through). 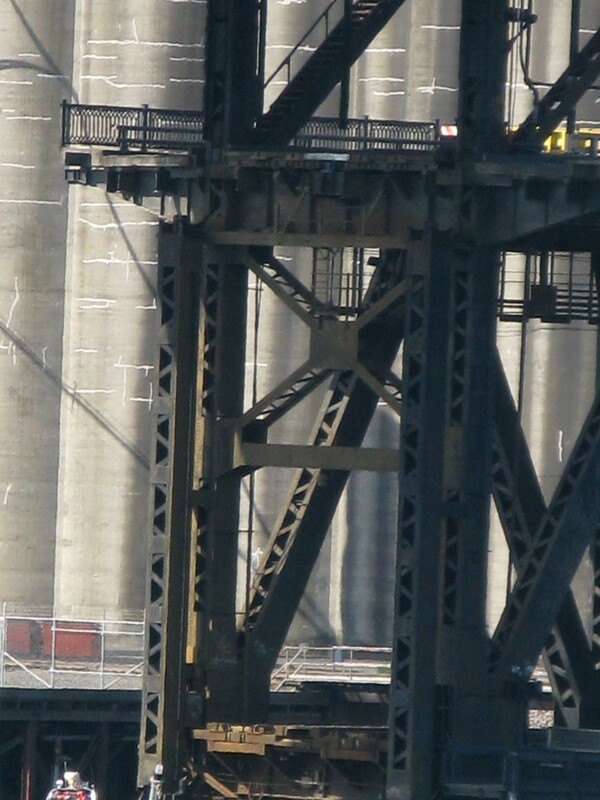 If a train is already in one of the bridge circuits when the bridge tender begins to prepare for a lift, the bridge cannot be lifted. That train has to proceed without delay off of the bridge (out of the circuit) so that the bridge span can be lifted. Trains will be held on red signals at all locations leading to the bridge for the duration of the lift. The arrival and departure of the fleet make for some difficult days for commuting (and here’s your advanced notice – when the ships leave in the beginning of next week, it’s going to happen again, so expect delays either sitting on the train or taking a shuttle bus). If you’re waiting to board a crowded train, please let the people who are trying to exit the train do so – there will be more room for you to board train once they’re gone. If there’s no room for you on that train, the one advantage you have in a bridge lift is that trains will be stacked up only minutes apart once they can cross the bridge, so you will soon be able to board one and continue on your way. 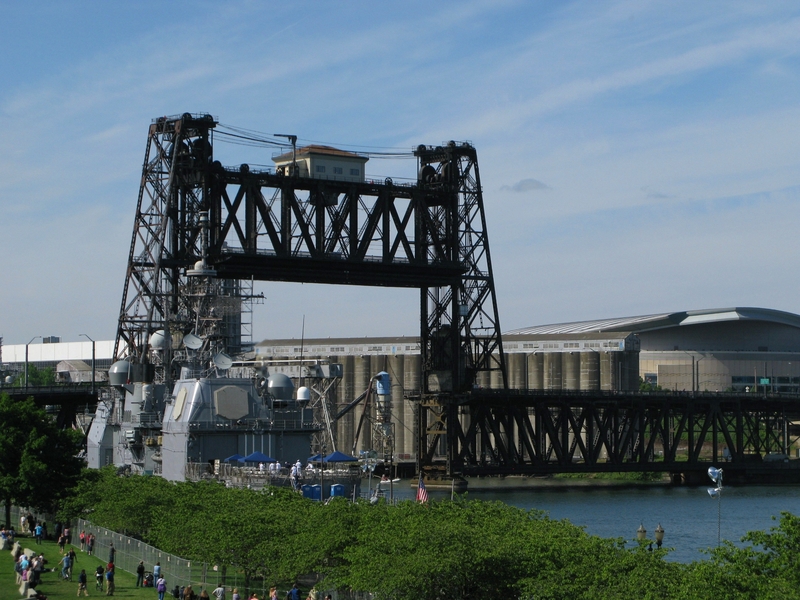 In the meantime, please be patient with the delays… enjoy the beautiful weather, and consider going down to the waterfront and checking out the fleet while they’re in town. It’s a neat opportunity for the general public to see these ships up close and talk with the men and women who are serving on them. We will soon be returning to your regularly scheduled commute.